Dwight D. Eisenhower had unarguably one of the longest and most taxing leadership roles in American history. For two decades, the lives of thousands, sometimes millions, of people and the fate of great nations hung on his decisions. As Supreme Allied Commander during World War II, Eisenhower oversaw the greatest amphibious assault in history, organizing the largest air and sea armadas ever assembled and commanding 160,000 men in the momentous Operation Overlord. After the success of that mission helped bring the war to a close, Eisenhower dreamed of going home to a happy and peaceful retirement. Instead, he went on to serve in five more globally pivotal positions: Head of the American Occupation Zone in Germany, Chief of Staff, president of Columbia University, Supreme Commander of NATO, and President of the United States of America. 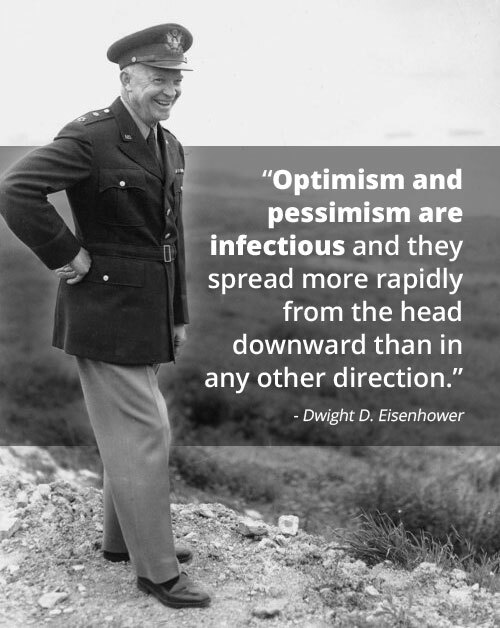 In each position, Eisenhower achieved great successes and also made mistakes. But whether he was navigating setbacks or achieving triumphs, he led. A self-described “simple Kansas farm boy,” his humor and congeniality—along with that famous lopsided grin—hid a keen and curious mind, an unyielding work ethic, and an ironclad sense of self-confidence. That confidence allowed him to stand tall with the weight of the world on his shoulders and boldly make critical decisions. The word his associates most often used to describe him was trust; people trusted Ike to make the right choices and shoot straight with them. 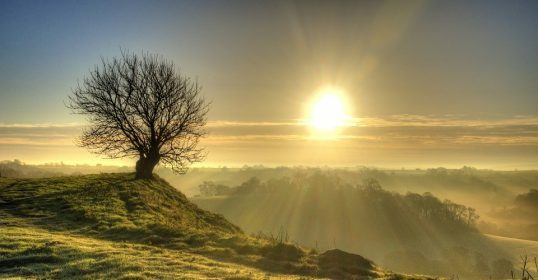 His dedication to principle and his bounding vitality could inspire people to lofty visions, while his aw-shucks humility created a feeling of friendship and intimacy even with those he had never met. These qualities and more won him the affection, loyalty, and admiration of those who served both under him and over him. 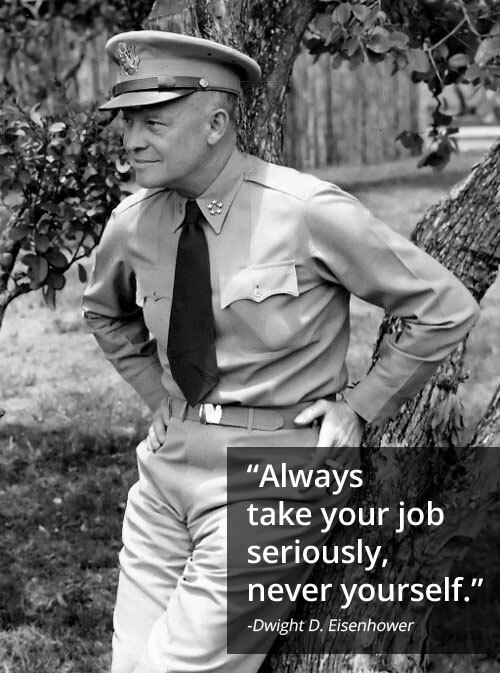 Truly, there is much to be learned from the life of Dwight D. Eisenhower, and so every other week for the next couple months, we’ll be taking an in-depth look at the many rock-solid leadership lessons that can be gleaned from his life, particularly his time in the military. While the rest of the articles in the series will be shorter, today we begin with a lengthier exploration of what was perhaps the cornerstone of Eisenhower’s success as a leader: his ability to build and sustain the morale of those under his command. 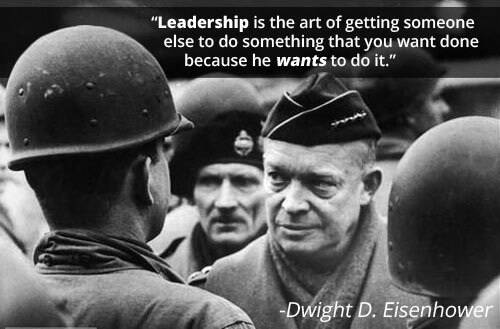 Eisenhower worked his men hard each day, taught them not to cut corners, and pushed them to always do their best. At the same time, he listened to them, inspired them with his own example, and cared for them like a father. 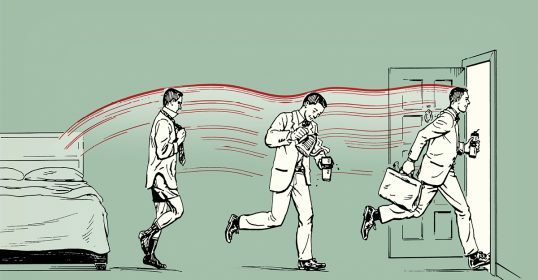 Whether you’re a student body president, a corporate manager, or a coach, these principles will hopefully help you better inspire and bring out the best in those for whom you are responsible. 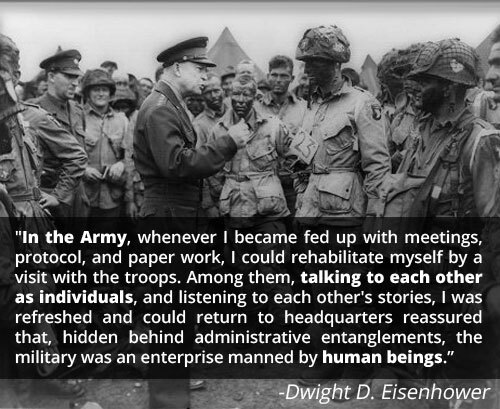 Eisenhower loved life and he loved people. 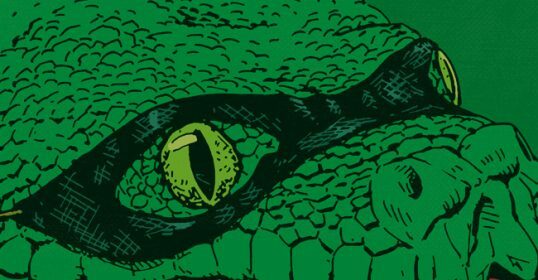 He believed in the latter’s strengths and was very sympathetic to their failings. Whether he was training a small unit or commanding thousands, he never saw the men as numbers, as push-pins to be moved across a map; rather, he always remembered that each man was an individual with hopes and aspirations of his own, with a family back home that loved him more than anything else in the world. In the months before D-Day, Eisenhower made these visits to the troops an even higher priority. He understood that once he issued the order for Operation Overlord to begin, he himself would become powerless; the success of the mission rested with the men who were storming the beaches of Normandy. If they bravely struggled through the Germans’ withering fire, the Allies’ aims would be achieved; if they cowered in the sand, the enemy would triumph. The level of the troops’ motivation could turn the tide. And so, as June 6 approached, Eisenhower went out to meet as many of his men as possible, visiting 26 divisions, 24 airfields, 5 ships, and a dozen other military installations. He wanted as many of his sailors, airmen, and soldiers to see the man who would be sending them into battle as possible, and to personally speak with as many of his men as he could. When he arrived at a camp or airfield, he’d ask the men to break rank and circle around him. Then he’d offer some encouraging words, shake their hands, and talk to the men one-on-one. Eisenhower did not ask them just about their weapons or training as most generals did, but instead where they were from, what they hoped to do when they got home, and what life was like back in their home states. The genuine tenderness Eisenhower felt for his men, and his acknowledgement of the very real, individual repercussions his decisions would cause, greatly increased his anxiety and the burden of his responsibilities. But while it wearied him, it also fueled the excellence of his leadership and the success of his command. Ike was the kind of commander both the men themselves, and their families, hoped they’d serve under. They knew that Eisenhower would not make a decision to send his men into battle if he had not thought long and hard about it and believed the action was absolutely necessary—that he would not play fast and loose with their lives, deciding their fate from inside an ivory tower. While Eisenhower was the one man during the war who might have been tempted to put on Napoleon-esque airs, that was far from his style. He saw the whole undertaking as a team effort in which each person, from the lowly private to the Prime Minister, had a vital and indispensable role to play. His job was simply to fit the many disparate parts into one effective whole. 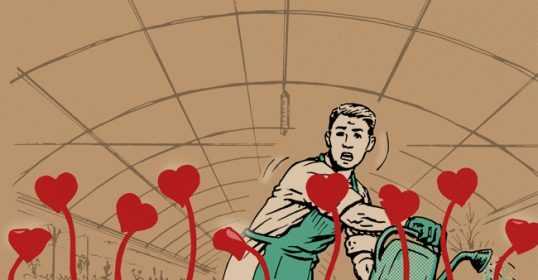 It was a heavy job, but he did not feel it made him special. Eisenhower was a man of modesty and humility who hated being singled out for praise and loved to sincerely put the credit on others. It was “GI Joe,” who won the war, he said, not him. 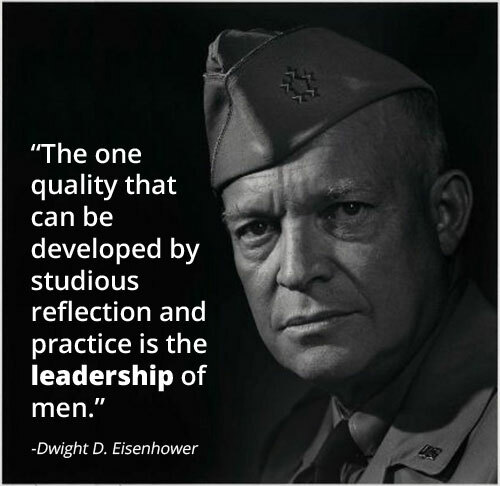 Eisenhower believed that one of the things that destroyed morale was complaints of unfairness or injustice among the men—feelings that could be engendered by seeing that their leader did not give them enough credit and took too many privileges for himself. These kinds of stories always got back to the troops, and helped win Eisenhower their affection and loyalty. In 1918, during WWI, Eisenhower was assigned to run Camp Colt in Gettysburg, Pennsylvania, with orders to “take in volunteers, equip, organize, and instruct them and have them ready for overseas shipment when called upon.” Because the men would go directly from the camp to a port to be shipped to the trenches of Europe, Eisenhower was “warned that no excuses for deficiencies in their records or equipment would be accepted;” when they left camp, the men had to be ready for battle. So without any orders from Washington, Eisenhower set up a telegraphy and motor school and obtained small caliber cannons on which to train his soldiers. He also got ahold of some machine guns and made the men get so familiar with them they could fire the guns from the back of a moving vehicle and could take the weapon apart and put it back together while blindfolded. Later, although the brass had told him that the Tank Corps in Europe would have no need for men with training in telegraphy, the War Department requested 64 men with that skill; Eisenhower was ready to furnish them. Because Eisenhower made such frequent trips to the battlefront, he knew the challenging conditions his men were living and fighting under. And he knew that while duty and discipline were essential in keeping the men going, such things alone were insufficient in maintaining morale. There must also be a “deep-seated conviction in every individual’s mind that he is fighting for a cause worthy of any sacrifice he may make,” Eisenhower argued. 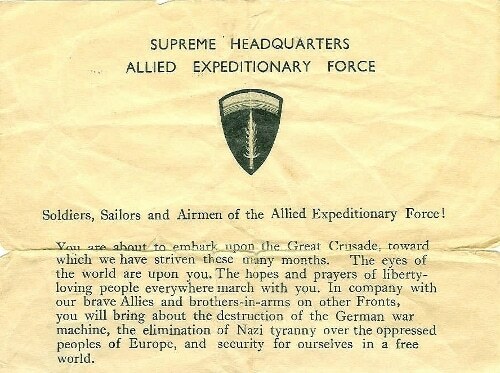 In other words, the men needed to know the why behind their orders.